You may think orcas or great white sharks are the most voracious predators in the oceans, but based on their abundance and ability to consume a wide range of prey items, chaetognaths (a.k.a. “arrow worms”) give those big animals a run for their money. Large predators like sharks are extremely rare, but scoop up a bucket of seawater almost anywhere in the world and you are likely to find a few chaetognaths (if you have a microscope handy). Chaetognaths are transparent worms that often remain motionless in the water column, apparently relying on the element of surprise to capture a wide variety of plankton, including copepods, appendicularians, small fish larvae, and smaller chaetognaths. Chaetognaths are thought to be generalist feeders because their stomach contents often reflect the community captured by plankton nets. They use a mass of chitinous hooks around their mouths to capture prey – which gives them their name (“chaetognath” translates from Latin to mean “hairy jaw”) and a notoriously menacing appearance. 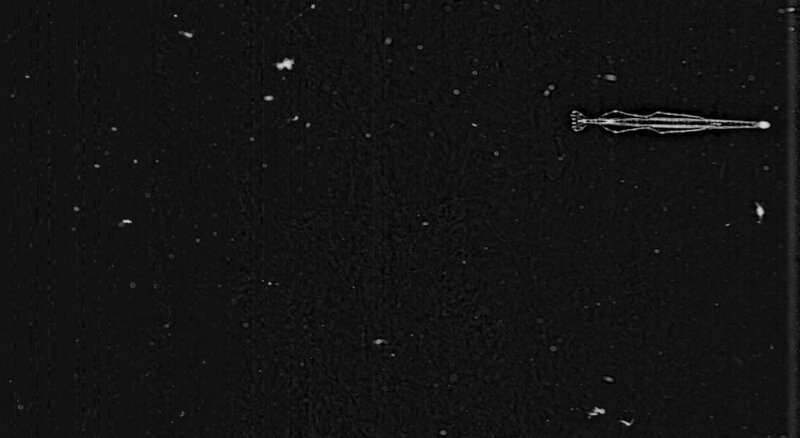 Chaetognaths are often straight in the ISIIS images but can also swim rapidly for short distances. The camera typically cannot resolve the tiny chitinous hooks on the chaetognath’s mouth. Chaetognaths comprise about 100 species that are all typically 1-2 cm long. They are most abundant along the coasts, with some species being so sensitive to salinity that oceanographers can identify discrete water masses based solely on the community of chaetognath species. Similar to many other types of zooplankton, chaetognaths are hermaphrodites, first being male then changing into female as they get larger. Fertilized eggs can be attached to vegetation or encased in a gelatinous web. Eggs then hatch into juvenile chaetognaths, and thus they have no larval stage. This is called direct development because there is no process of metamorphosis. 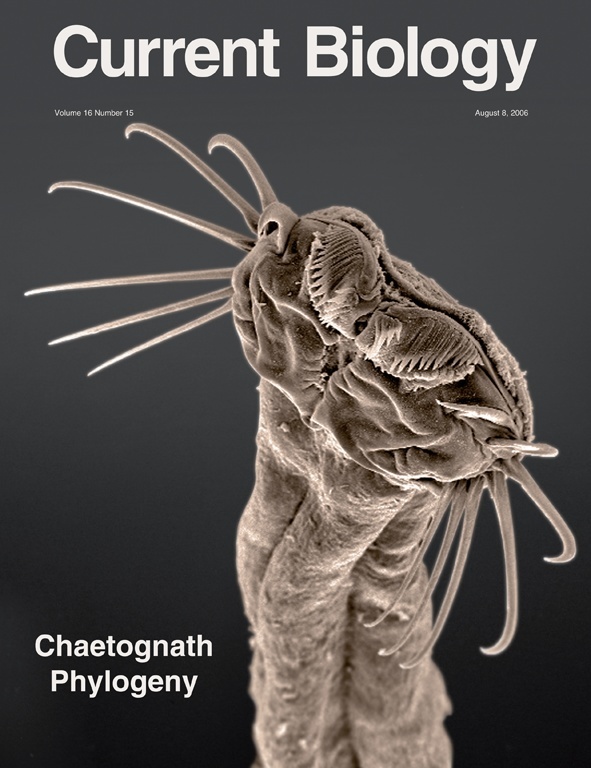 A clear image of the chaetognath’s mouth on the cover of Current Biology. The chaetognath’s body is streamlined and adapted to feeding with minimal visual input. The have sensory cilia that can detect small vibrations in the water that tell the chaetognaths that prey is within striking distance. With a quick flick of its tail, the chaetognath surges forward to capture the prey in its chitinous hooks used for grasping. It then transfers the prey to its mouth where it is swallowed whole. Some deeper water chaetognaths (>700 m deep) can even use bioluminescence to create a cloud of light that scientists think can be used to escape predation (Haddock and Case 1994). 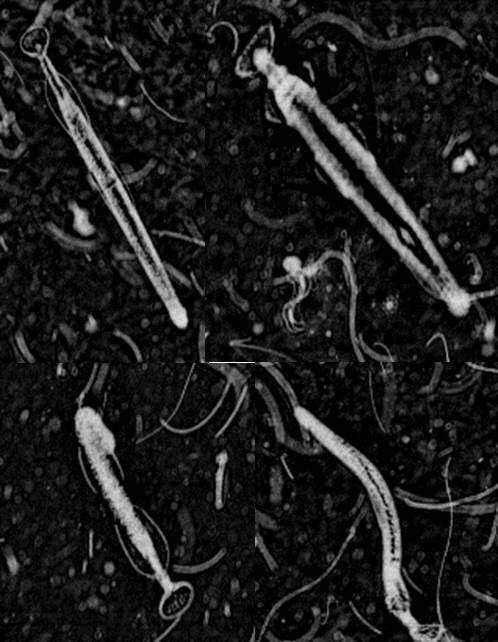 The most handsome chaetognath found by our citizen scientists!